Aloo matar recipe (aloo mutter recipe) – This is punjabi style of making aloo mutter gravy. This is made in pressure cooker only. Hence this can be done very quickly. 1) Gujarati style aloo matar – it has no onion no garlic. 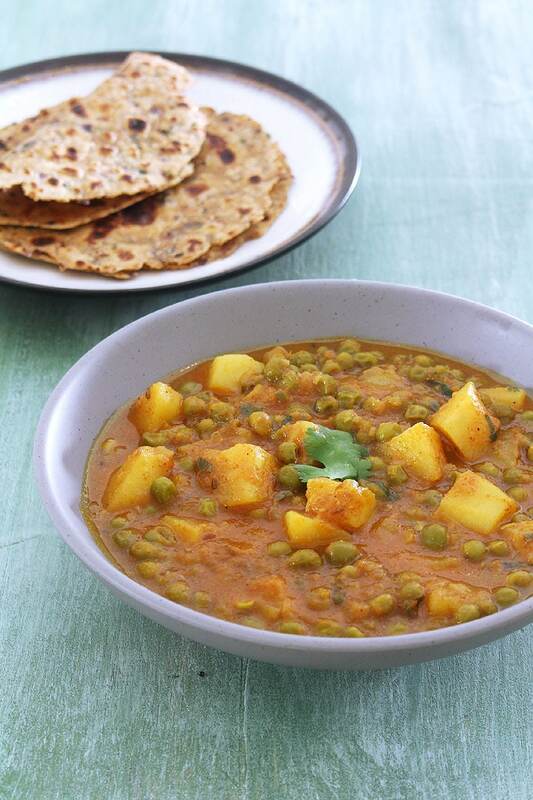 2) Sookha aloo matar – this is dry version. I usually serve this with roti, dal-rice. 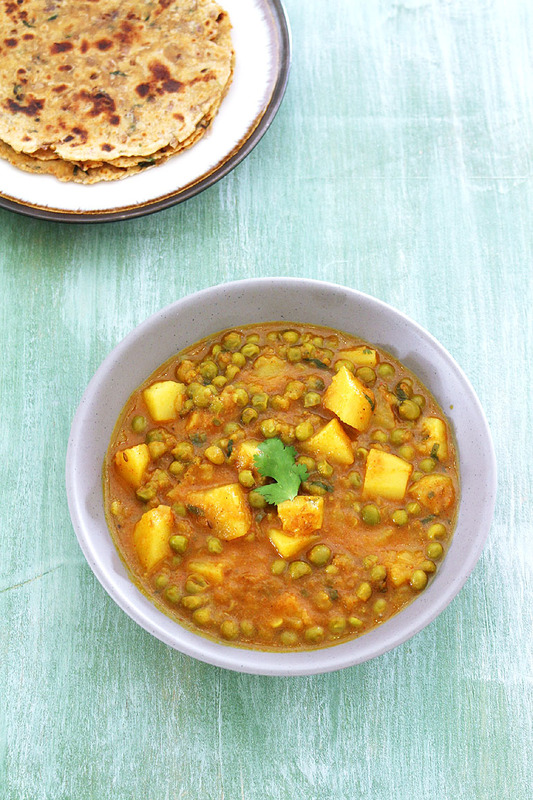 today’s recipe is the Punjabi style of making aloo mutter. It has gravy made from onion and tomatoes. For making this recipe, very basic spices are used. Still this taste fantastic. This is one of my go to recipe whenever I am in rush. 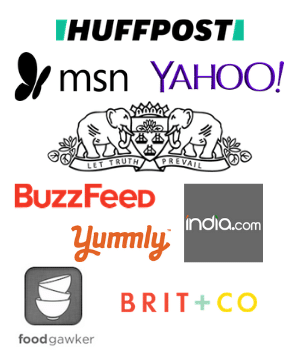 The ingredients used are very common, basic and I always have them in my kitchen. I quickly chop onion, potatoes and prep other ingredients which will take about 10 minutes. Then throw everything in pressure cooker and let the cooker do its own work. While it is pressure cooking, I make paratha. And I have delicious dinner ready within an hour. 1) Heat the oil in a pressure cook on medium heat. Once hot add cumin seeds and let them sizzle a bit. 2) Then add chopped onions and sprinkle some salt. Salt will speed up the cooking process. 3) Cook till onions are soft and light pink in color. 4) Now add ginger paste, garlic paste and green chilies. 5) Mix and saute for a minute or till the raw smell of ginger garlic goes away. 6) Then add prepared tomato puree. 7) Mix well and let it cook. If it splutters a lot, you can partially cover it. 8) Cook till it becomes thick and no more watery part left. Oil may starts to ooze out from the sides. 9) Now add remaining salt, red chili powder, turmeric powder, coriander powder and cumin powder. 11) Now add cubed potatoes and peas. 12) Mix well, so all the masala is coated to the potatoes and peas. 13) Add 1 cup of water and mix well. 14) Cover the pressure cooker with lid, put the weight on. Cook on medium heat for 2 whistles only. Then turn off the stove and let the pressure go down by itself. Then open the lid. 15) Now add garam masala. 16) Mix well. If you find the gravy is too thin then you can let it simmer for few minutes and gravy will becomes thick. Also you can break few potato pieces using back of spatula which will help to thicken the gravy. It is ready to serve. If not serving right away then keep it covered. Keep in mind that, as it sits the gravy will get thicker. Because potatoes have tendency to absorb the liquid. 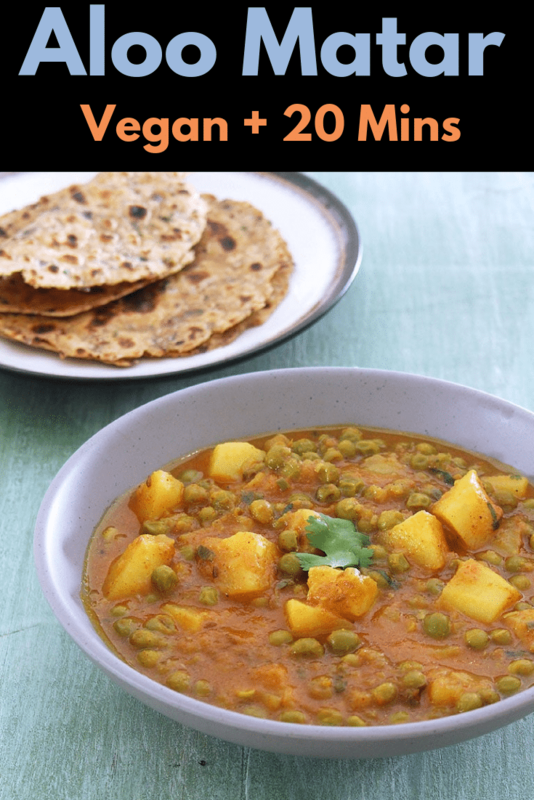 Serving suggestion: Serve aloo matar masala with roti/phulka or paratha. It can be served with plain rice or jeera rice too. I always like to serve kachumber on side. 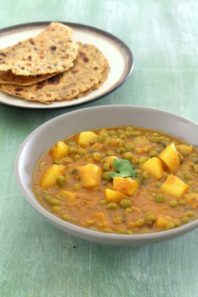 This punjabi style aloo matar gravy made in pressure cooker that goes well with roti, paratha. Heat the oil in a pressure cook on medium heat. Once hot add cumin seeds and let them sizzle a bit. Then add chopped onions and sprinkle some salt. Cook till onions are soft and light pink in color. Now add ginger paste, garlic paste and green chilies. Mix and saute for a minute. Then add prepared tomato puree. Mix well and let it cook. If it splutters a lot, you can partially cover it. Cook till it becomes thick and no more watery part left. Oil may starts to ooze out from the sides. Now add remaining salt and spice powders. Mix well and cook for a minute. Now add cubed potatoes and peas. Cover the pressure cooker with lid and cook on medium heat for 2 whistles only. Then turn off the stove and let the pressure go down by itself. Then open the lid. Now add garam masala. Mix well. If you find the gravy is too thin then you can let it simmer for few minutes and gravy will becomes thick. Also you can break few potato pieces using back of spatula which will help to thicken the gravy. Kanan – Just a quick note to thank you for a fantastic (and simple) recipe for my favourite meal. My family think I am a superstar dad and my relatives have all requested this recipe. Uncomplicated ingredients with excellent results. Very glad to hear that everyone enjoyed it. This is the best recipe I’ve found in a long time…I don’t have a pressure cooker…How can I cook this on top of the stove without loosing the consistency of the sauce? It may take around 20-25 minutes on stove stop.